World renowned for its millennial history of porcelain production, China’s “Porcelain Capital” of Jingdezhen attracts a wide audience of eager visitors from all corners of the world to its annual Jingdezhen International Ceramics Fair which takes places on the dawn of every autumn. Artists, craftsmen, designers, hobbyists, collectors, businessmen, tourists, scholars, and many others anxious to delve into the history and contemporary practice of porcelain congregated at the Fair this year from October 17 - 21. With fourteen successful years to its credit, the Jingdezhen International Ceramics Fair serves as a platform for the display of ceramic finesse, amalgamating works from places such as China, North and South Koreas, Japan, Taiwan, Turkey, Holland, United Kingdom, and the United States of America with The Bahamas being proudly represented for its second time in the Creative Nassau booth as a sister city in the UNESCO Creative Cities Network (UCCN). The booth was once again curated by Bahamian ceramic artist, Alistair D. Stevenson who is studying towards a degree in ceramics in Jingdezhen. 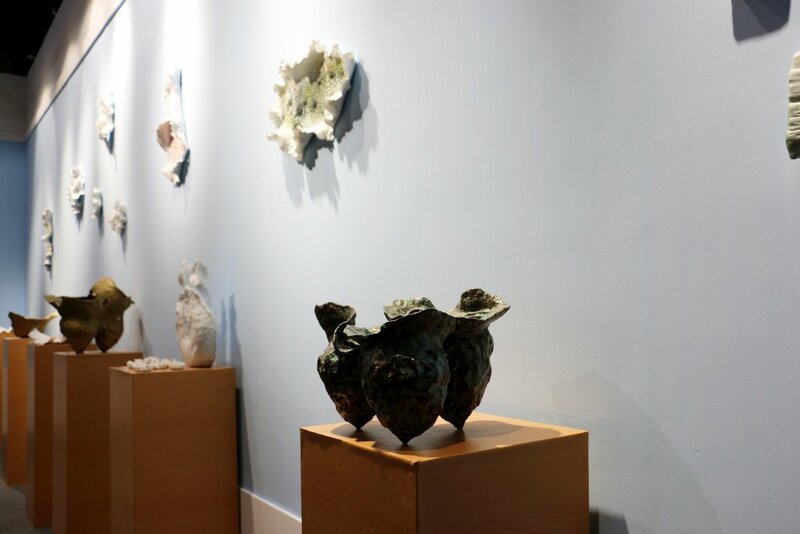 Stevenson presented a series of over 20 porcelain sculptures examining “The Fragility of Life” as a continuing theme in his “Fragility” series which was on display this summer at Doongalik Studios Art Gallery in Nassau. The use of ceramics as the primary medium for the display emphasized the delicacy of life itself, suggesting that human beings should cherish both their own lives as well as the lives of others. With the variety of surface decoration, curving edges and overall elegant movements, the work automatically brought a sense of nature into a space, reminding audiences of the importance of embracing life outside of everyday work, and of finding enjoyment from family, friends, love, tradition and contemporary ideas. Stevenson also invited Japanese sculptor, Hidemi Tokutake, to be a guest artist in the display. With similar sources of inspiration from organic objects found in both oceanic and vegetative environments, the works of both artists harmonized smoothly to successfully impact the space. The Creative Nassau booth won the attention of many visitors to the ceramics fair, and was the focus of television, newspaper and magazine journalists of Jiangxi Province. 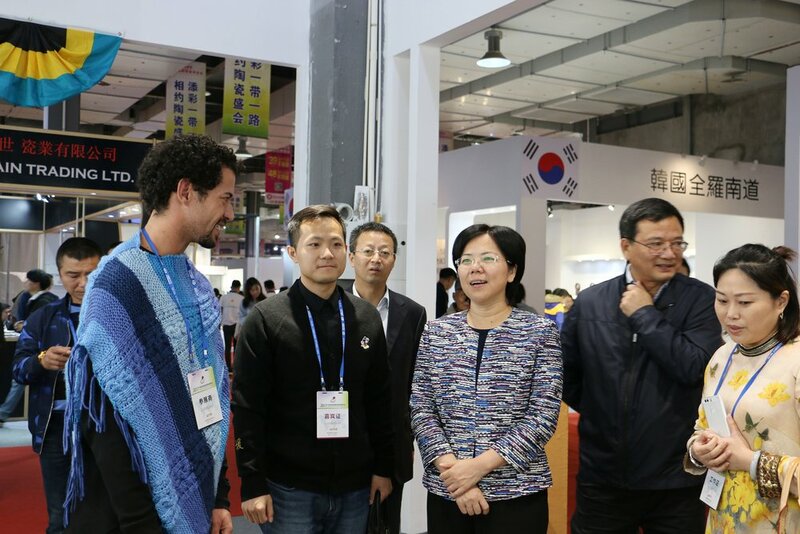 The booth also had the honour of being visited by the City of Jingdezhen’s Mayor, Mrs. Yi Mei, to whom Stevenson presented one of his works as an expression of gratitude for the opportunity to represent The Bahamas at the exposition. As a creative entity, Creative Nassau looks forward to continued participation in this expo and others around the world. It is through such networking opportunities with other creative cities in the UCCN that The Bahamas can continue to expose and define its world class artistic presence as a partner of the global creative economy.